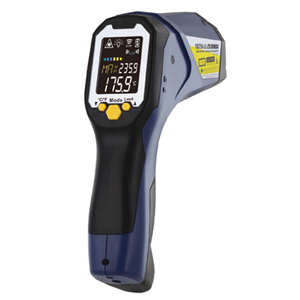 The high-performance, handheld OS758-LS dual infrared thermometer is a non-contact temperature measurement instrument. The OS758-LS offers a wide array of features including adjustable emissivity, color backlit LCD, 60:1 distance to spot, hi/ low temp alarm, max/min/avg/ diff temperature monitoring and data storage. This meter is also designed with a microSD card slot (SD card included). The OS758-LS offers a rugged design that is shatterproof at 1 m (3.3'') with an ergonomic rubber boot handle. A Type K thermocouple input is included for contact measurements, often used to verify emissivity. Preços indicados em Reais e já incluem todos os impostos e taxas de acordo com a legislação vigente. Nota: Comes complete with CD, USB cable, SD card, 1 Type K thermocouple, black hard carrying case, 2 “AA” batteries, and operator’s manual.